Skulls And Kisses | UK Lifestyle and Alternative Fashion Blog. : Tuesday's Playlist, 26.1.16. So it's about time I shared some music with you all again, it's been quite a while since my last playlist, so here's what I've been listening to recently, some super super new new and some old. In an order which I would probably play them through the week to be fair, because why would you not play bonfire on a Friday? Perfect predrinks music. 1. LA Devotee - Oh hello brand new Panic at The Disco, how did you produce such a perfect album after your last few? Don't get me wrong Pretty Odd was highly anticipated and I felt slightly let down by it, I never really cared for anything that came after until this. When Hallelujah came out I couldn't wait for the full album and oh man it doesn't disappoint I actually love it, I've had it on repeat for days. LA Devotee is one of my favourites from the album though, it's so catchy and the music is so dancy and it makes me feel so happy. Favourite Lyrics - You got two black eyes from loving too hard, and a black car that matches your blackest soul. I wouldn't change ya, oh oh, wouldn't ever try to make you leave, no. 2. Ancient History - So I was sat watching Kerrang one night and on come Set It Off, I've never heard of them or listened to them but I was like oh hey who's this babe on my tv and kinda fell a little in love. This song is super catchy and kinda has a pop punk vibe to it and I like that. The lyrics are pretty great, I mean I guess they're about a break up but they're great and sound super happy. Favourite Lyrics - I know, I know how to drive you wild, you know, you know, how to make me smile. 3. Happy Song - I'm Still 100% skeptical about the entire album, but this song, this song is amazing. I don't even know what it is about it, maybe the chanting, the lyrics I dunno but something about it if I hear it instantly makes me feel better about everything. Favourite Lyrics -And I really wish that you could help, but my head is like a carousel and I'm going round in circles. 4. You Want A Battle (Heres A War) - There's not a lot to say about this really, it sounds like standard Bullet for My Valentine and I really like the 'we will not take this anymore' bits but it's nothing overly special about it apart from I've just really enjoyed listening to it recently. I guess I just really like Matt Tucks voice in it. Favourite Lyrics - Now you're the victim, I'm making you feel like you are me. 5. Bonfire - This is the most perfect song for predrinks, I hear it and no matter what time of day it is I'm 100% ready to go out and get mortal. It actually makes me feel so bouncy about and hyper I can't even describe it haha. Probably because it's one of my favourite night out songs it puts me in such a good mood haha. Definitely add it to your pre drink playlist. Favourite Lyrics - Can't really say I have any favourite lyrics because there aren't very many haha. 6. All The Rage - Funeral For A Friend are unreal forever, this song is one of my all time favourites, the lyrics are so good and it's so catchy and it's perfect that's all I have to say on the matter. Favourite Lyrics - Like sitting in the back seat (it's all the rage), and boring me with your body (it's all the rage), and how many times can I say I'm sorry (it's all the rage), and really mean it. 7. 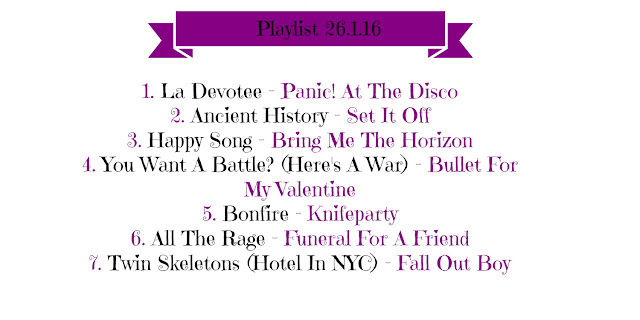 Twin Skeletons (Hotel In NYC) - Of course it wouldn't be my blog without including Fall Out Boy would it? I wasn't a fan of this song when I first heard the album, it just didn't sound that good at first but then again I only gave it two lines of the verse and skipped. I accidentally listened to it in full and I loved the bridge/chorus Patrick's voice is amazing and the lyrics are becoming some of my favourite! Favourite Lyrics - I just need enough of you to dull the pain, just to get me through the night. What music have you been loving recently? Do you have any suggestions for me?